One of the many debates at the National Committee of Uniform Traffic Control Devices Bicycle Technical Committee was focused on the spacing of bicycle shared lane markings. The NACTO Urban Bikeway Design Guide offers guidance in the form of a picture on the placement of sharrows. The debate surrounds the minimum distance between the sharrows and one interest is to make sure that the sharrows aren't confused as a bike lane. 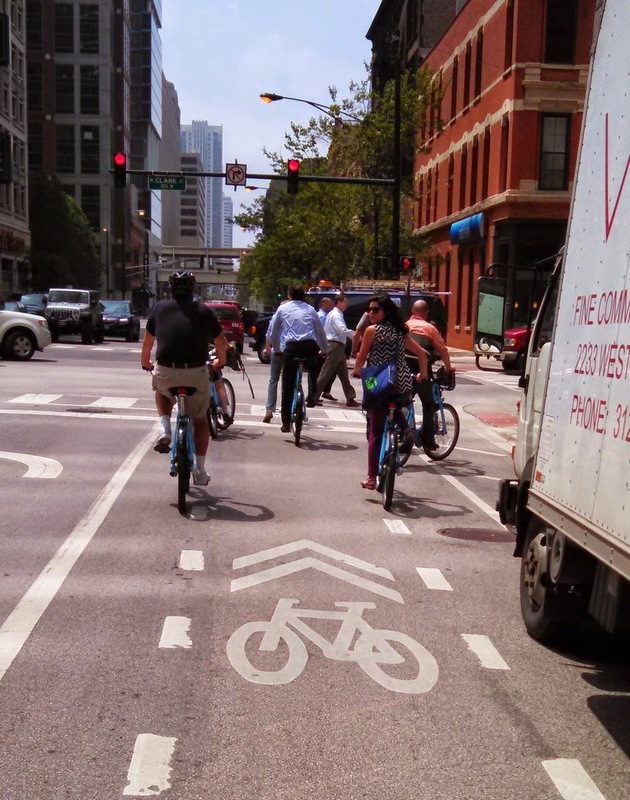 Are sharrows spaced at 25 feet likely to be confused as a bike lane? The NACTO guide provides a recommendation that includes the following text: Frequent, visible placement of markings is essential. The number of markings along a street should correspond to the difficulty bicyclists experience taking the proper travel path or position. SLMs used to bridge discontinuous bicycle facilities or along busier streets should be placed more frequently (50 to 100 feet) than along low traffic bicycle routes (up to 250 feet or more). SLMs used along low volume routes can be staggered by direction to provide markings closer together. The MUTCD has not had much guidance on the spacing of shared lane markings. Section 9C.07 of the Manual does not provide any minimum spacing between sharrows. The Manual does provide guidance on the idea that they should not be used at a distance of greater than 250 feet. Of course, the Bicycle May Use Full Lane sign could be used as described by Section 9C and it shows the impact that guidance like the NACTO Urban Bikeway Design Guide has on the MUTCD. Shared lane marking in Chicago in advance of the traffic signal. MUTCD is determining the spacing between these symbols. If used, the shared lane marking shall have a minimum longitudinal spacing in accordance with Table 9X-AA. The maximum spacing proposed in the next edition is 250 feet and is only a guidance statement. Another interesting topic was the use of sharrows when a bike lane drops like this example from New York City. Shared lane markings showing the shared use of the curb lane in advance of a traffic signal. These are the sort of details that are discussed at the National Committee.The details matter.